"" Bleh and Awe: Happy birthday R.P. Feynman ! 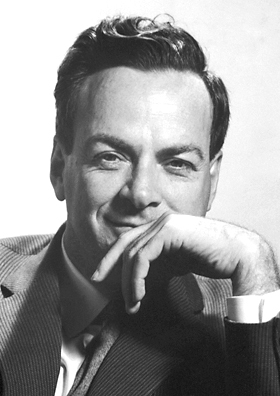 May 11, 1918 is the birthday of Richard P. Feynman, one of the greatest scientists who ever lived, and he continues to inspire millions of aspiring students by his scientific work and him, um wackyness. I read about him in, what is still one of my favourite books (I wish I hadn't lost it) "Surely you're joking, Mr. Feynman". Feynman was involved in the Manhattan Project, he (also with two other scientists) was credited with the Noble Prize for his work on Quantum-ElectroDynamics (QED), he worked on problems of superfludity of supercooled liquid Helium (that is how does liquid Helium behave as a superfluid when cooled to extremely cold temperatures), described the interaction of sub-atomic particles via pictorial descriptions which are known as "Feynman Diagrams", and he is called "The Father of Nanotechnology" as in one of his lectures "There's plenty of room at the bottom", the the list of academic achievements is endless. He was a painter, a bongo-drum player, an active gambler, a party-animal, and something of a genius. What I learnt about him was: there are certain prodigies, and well, the other way is to do smart work (which does include hard work). The thing is with Feynman (what I understood) that the man was all about practicality. He loved to vision the things in detail. When there were complex problems, he broke them down, or 'chunked' them into tiny solvable bits, and there by solving the whole problem. He had interests ranging from atomic physics to birds to eating fish to travelling. He is and will be the genius, but the picture isn't exactly that. He wasn't the dull science teacher type dude who sat in his cubicle and memorized books and had several Eureka ! moments. He was always playing, and he loved to play around. This habit was there from childhood, and lasted till adulthood. He had more fun than we can ever imagine, he went to parties, met a variety of people, traveled the globe, just because of his unquenchable curiosity. In short: He was Awesome ! Today 11th May is his birthday, and I would like to wish him a very happy birthday !